How Do Trump Voters Feel Ahead of the 2018 Elections? As November approaches, there are more and more signs that should make Democrats feel good about their chances of winning back the House of Representatives. The recent win by Conor Lamb in a Pennsylvania House District that President Trump won by 20 points has certainly aided in this euphoric feeling. Democrats hold a strong lead in the generic horse race question in most public polls. In fact, they hold a seven-point lead, according to the Real Clear Politics average. That being said, as we have discussed, Democrats should not sit back and accept a “wave election” as a given. Our most recent national survey of 1,000 adults has revealed another hopeful signal for the Democrats. Indeed, they hold an 11-point advantage when it comes to the preferred outcome of the 2018 elections. This is a slightly different approach of looking at the data, but we feel this often can be more indicative of voter sentiment come November. Republicans should be concerned that just 35% of the country want them to remain in charge, but you also can see in the chart below, that neither party has a majority on this measurement so far. Almost 1 in 5 Americans are unsure of how they would like the election to play out, which provides an opportunity for both parties. At this time, Democrats have locked down their base. Of the 46% who are ready for a Blue Congress, 87% identify as Democrats and 88% voted for Clinton in 2016. While Democrats have their base ready for November, clearly Democrats will have to do more to get the majority of the country behind the idea of a Democratic-controlled Congress. One group absolutely worth looking at are Disenchanted Trump Voters. 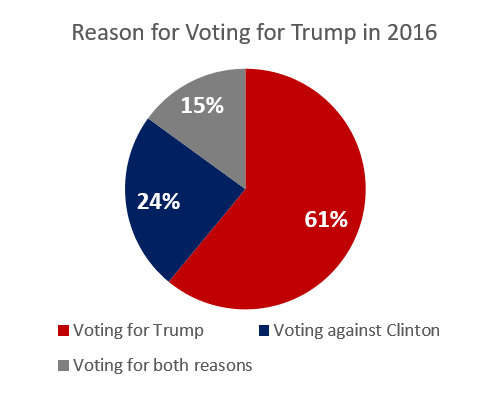 In our recent survey, we asked 2016 Trump voters to label their reason for voting for the President into three categories — voting for Trump, voting against Clinton, or both equally. 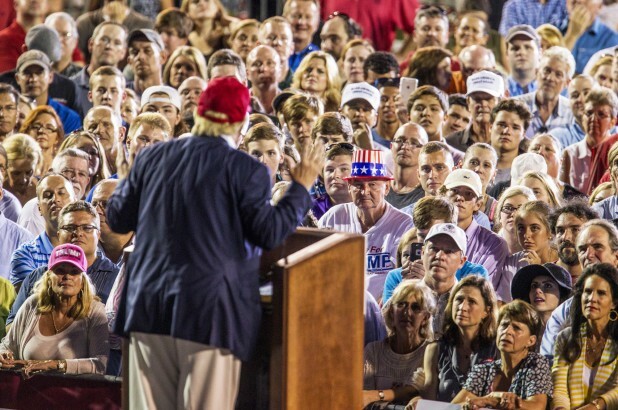 Sixty-one percent (61%) of Trump voters chose Trump because they wanted a Trump administration, 24% of Trump voters chose Trump because they were voting against Clinton and 15% of Trump voters selected Trump on their ballot both because they were voting for Trump and also because they were voting against Clinton. When looking at Trump’s job approval ratings, there is a predictable distinction between how Democrats and Republicans view Trump’s administration now. However, when looking at 2016 Trump voters, the impetus behind their vote provides an interesting insight into their current feelings on Trump’s performance. When voters cast their Trump ballots in 2016 because they wanted a Trump administration, 93% of these voters currently view him favorably and 97% approve of the job he has done as President. When Trump voters cast a Trump ballot as a vote against Clinton in 2016, we see a different story. Among these voters, only 64% view him favorably. Granted this is still a majority, but 30-points lower than the true Trump supporters. The differences between the two groups become clearer when we asked Trump voters about the President’s job approval. Again, we ask this question a little differently and give respondents three options — do you approve of what Trump has done and how he has gone about it, do you approve of what Trump has done, but disapprove of how he has gone about it, or do you disapprove of both what Trump has done and how he has gone about. Among the Trump voters who voted because they liked Trump, 76% approve of both what Trump has done and how he has gone about it while 21% approve of what Trump has done but not how he has gone about it, and only 1% disapprove of both what Trump has done and how he has gone about it. 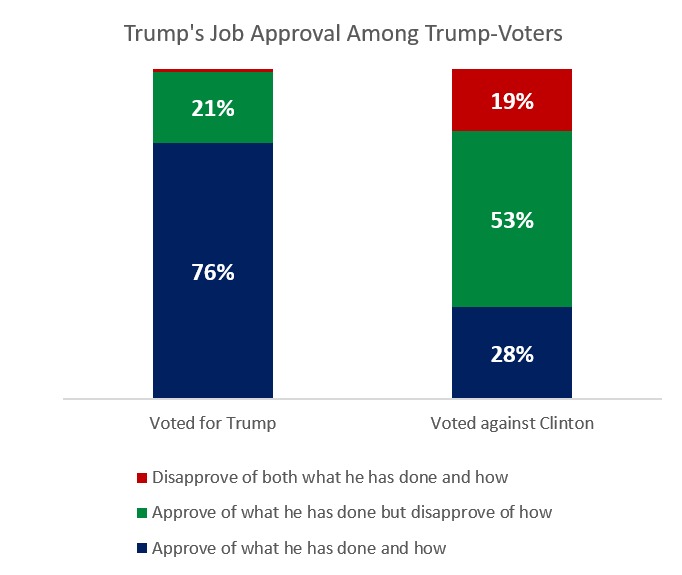 Alternatively, among 2016 Trump voters who were voting against Clinton, only 28% of voters approve of both what Trump has done and how he has gone about it, the majority (53%) approve of what Trump has done but disapprove of how he has gone about it, and 19% disapprove of both what Trump has done and how he has gone about it. 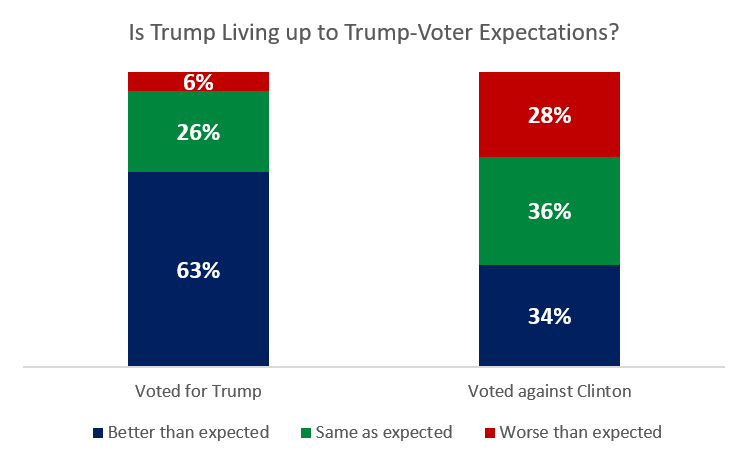 This contrast among 2016 Trump voters is also prevalent when analyzing how Trump measures up to voters’ expectations. Almost two-thirds (63%) of Trump voters who voted because they wanted a Trump administration currently feel that Trump is performing better than they had expected, 26% say he is performing the same as they expected, and only 6% say he is performing worse than expected. However, anti-Clinton Trump voters were more split on this issue. A third (34%) of anti-Clinton Trump voters say Trump is doing better than expected and 28% say he is doing worse than expected. When we put these factors together, we see that not all Trump voters should be considered equal and there is an opportunity for Democrats to win over some of these voters. A majority (52%) of Trump supporters are what we would consider to be true Trump believers and basically untouchable for Democrats. These voters voted for the President, like what he is doing, and feel he is doing as well as or better than expected. There is a second group that is less of true believers who voted for Trump but aren’t exactly thrilled with the President’s current approach. 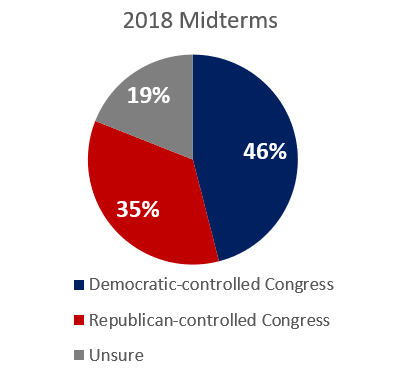 Among this group, 84% are still unlikely to feel that a Democratic Congress is the preferred outcome in 2018 and 14% are unsure. Perhaps of most interest to Democrats are voters who voted against Clinton and either completely disapprove of the President or approve of what he is doing but disapprove of how he is doing it. Either way, these are voters who chose Trump, but not because they wanted a Trump administration, and now disapprove with all or at least some of the job he is doing as President. Among these voters, Democrats may be able to pick up a few disenchanted former-Trump voters. 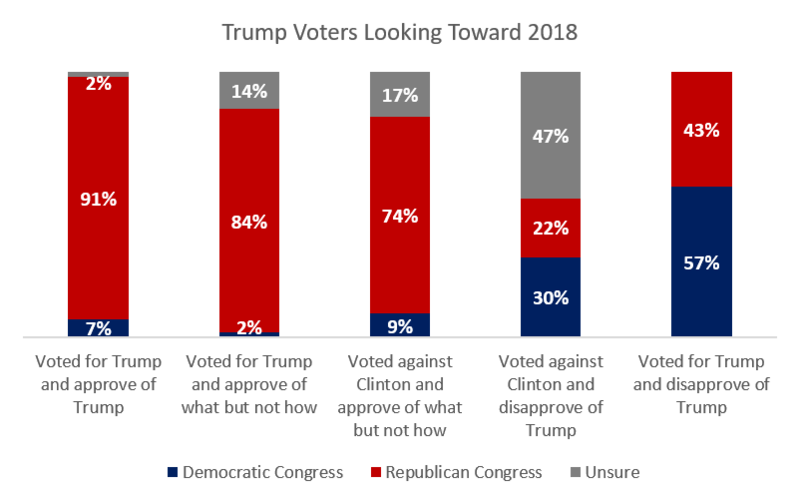 Looking at Trump voters who voted against Clinton and now only partially approve of Trump, almost 10% believe we need a Democratic-controlled Congress in 2018 to push back on Trump’s agenda. Additionally, Trump voters who voted against Clinton and completely disapprove of Trump have 30% of voters who think we need a Democratic-controlled Congress in 2018. While these two categories together only make up 13% of the electorate, as we have seen from recent special elections, in a close race, every vote counts, and Democrats might be receiving important votes from the unlikeliest of allies heading into November.